Cattle grazing as a mob. Yesterday’s paddock (foreground) is evenly grazed and trampled. I don’t want to tempt Fate, but I have to say the conditions for grazing on our farm have never been better. When we started, the land had been tilled for years, which is, by design, a catastrophe for the soil. Now in our third summer of grazing we see evidence that the soil health is coming back: there is earthworm activity where there was none before, and the pastures are thick and lush. 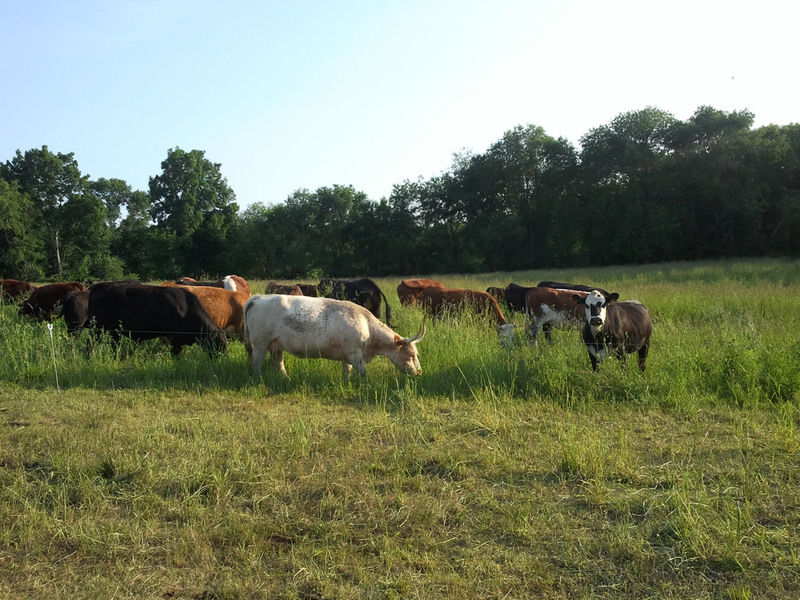 With thicker vegetation, we can now stock more cattle per square foot on the land. We seem to have reached that critical herd size where the cattle start to behave as a “mob.” They stay bunched together as they mow down the forage evenly, trample what remains evenly, and deposit manure evenly throughout the field. As always, we move the cattle to a new paddock each day and we let the land rest for a long time before hitting it again. On top of it all, we have benefited from a perfect balance of sun and rain throughout the spring. We are hoping it keeps up, and we are making beef while the sun shines.